Pain Clinic Spring Hill: Is pain affecting your life? Don’t wait any longer! There is no person who has been pain-free their entire life. After all, the purpose of this unpleasant sensation is to allow the body to react and prevent further tissue damage. People experience and describe pain differently, though, which can make it difficult to diagnose and treat. Many pain clinics focus on treating symptoms and relieving pain. In contrast, our Pain clinic in Spring Hill concentrates on identifying the source of pain and then determining the most effective and beneficial treatment plan for each particular patient. Whether it is moderate, acute or chronic pain, our doctors specialize in individualized pain management solutions for all types of pain syndromes by providing comprehensive and personalized care. According to the American Board of Pain Medicine, the definition of pain management is “a discipline within the field of medicine that is concerned with the prevention of pain, and the evaluation, treatment, and rehabilitation of persons in pain. Some conditions may have pain and associated symptoms arising from a discrete cause, such as postoperative pain or pain associated with a malignancy, or may be conditions in which pain constitutes the primary problem, such as neuropathic pains or headaches.” In other words, pain management is a medical speciality that focuses on the evaluation, treatment and prevention of all different types of pain. What is pain and what are different types of pain? According to the International Association for the Study of Pain, pain is: “an unpleasant sensory and emotional experience associated with actual or potential tissue damage, or described in terms of such damage.” In other words, pain is an uncomfortable feeling, serving as an alarm that tells your body something might be wrong. Equally important to know is that pain is a subjective feeling, meaning everyone experiences pain differently and no one can know exactly what somebody else’s pain is like. This actually can make it difficult to define and explain pain. To treat pain, the most important steps are to find out the source of pain, discover what sort of pain it is, and then determine a proper treatment plan for a particular patient. All the mentioned steps will be taken by our pain management doctor in Spring Hill. We know how crucial is to target the source of pain, not just the symptoms. Chronic pain: lasting for more than 3-6 months, or persisting beyond the course of an acute disease, or after tissue healing is complete. It’s associated with conditions such as fibromyalgia or osteoarthritis and usually does not decrease with most treatments. Acute pain: occurs suddenly but is temporary, for example, coming immediately after spraining your ankle. It’s associated with emotional stress and anxiety. Pain abates once the injury heals, but it may become classified as chronic if it lasts for over three months. Neuropathic (nerve-based) pain is caused due to damage or dysfunction in the nerves, brain or spinal cord. The pain is characterized by a stabbing, burning or tingling sensation. It can last for a long period of time, and the result can be chronic pain. Nociceptive pain is caused due to tissue damage, including from injuries to muscles, tendons or bones such as cuts, bruises, burns, fractures, cancer and surgery. This includes also visceral pain, which may be due to things like appendicitis. Pain resolves when the injury heals. Psychogenic pain is caused by psychological factors. Pain usually occurs due to tissue or nerve damage, but increases and is prolonged because of mental, emotional, or behavioral factors such as stress, anxiety, fear or depression. Psychogenic pain is often harder to treat than nociceptive pain or neuropathic pain. Our pain management doctor in Spring Hill knows that not only assessment and diagnosis are key for successful pain management, but also that recognizing the right kind of pain plays an important part in providing the most effective and adequate treatment. At pain management in Spring Hill, we treat every patient as an individual who requires specialized care. Besides providing quality service, we always make time to really listen to our patients and explain each procedure or pain treatment option in detail. We know the importance of developing procedure and treatment protocols to relieve pain. What does our pain management doctor in Spring Hill do? A pain management specialist is a medical doctor (M.D.) or doctor of osteopathy (D.O. 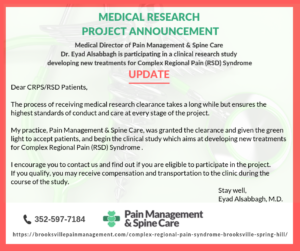 ), who has received special training in the evaluation, diagnosis, and treatment of all forms of pain. 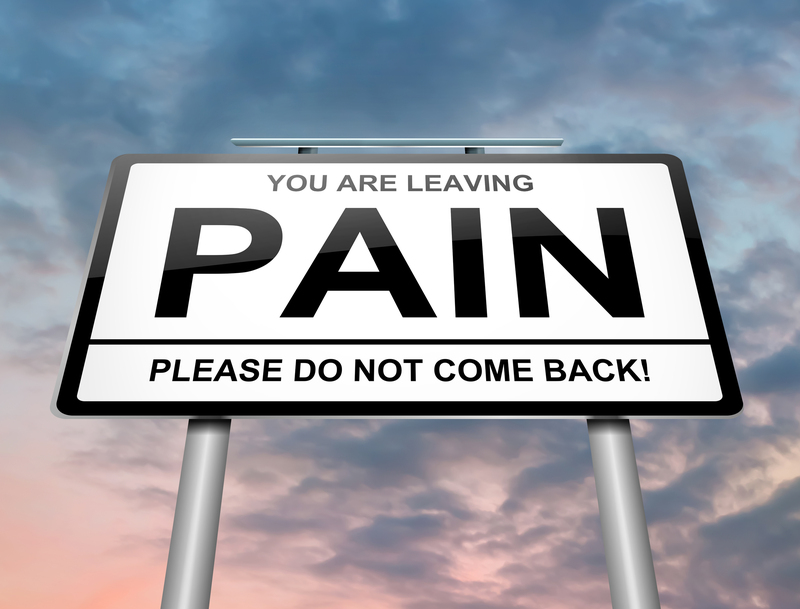 Our pain doctor in Spring Hill additionally has extensive knowledge of the psychology of pain. He uses specialized methods to diagnose the cause of pain properly and provide high-quality treatment. Regardless of whether you suffer from daily aches and constant discomfort, such as complex regional pain syndrome (CRPS), chronic back pain, fibromyalgia, or post-surgical pain, our pain experts offer a wide rage of the most advanced and cutting-edge services for acute and chronic pain. Our pain clinic is staffed by highly skilled and experienced specialists in pain management, who not only can conduct a complete examination of your medical conditions but work together to find an effective solution to reduce or get rid of your pain. We want to improve your ability to achieve your daily tasks and restore your quality of life. Pain Management & Spine Care’s Medical Director, Dr. Eyad Alsabbagh, is a fellowship-trained Interventional Pain Medicine pain doctor in Hernando County, trained and educated to provide the highest quality of service to patients suffering from multiple conditions, including narcotics addiction and back pain. He utilizes state-of-the-art technology at his pain management clinic in Brooksville. The doctor understands that pain is a very personal experience, which is why he evaluates patient’s individual needs and determines what sort of treatment will be most beneficial for that particular person. Our goal is to help you ensure a fuller, pain-free life. If you have any additional questions, please don’t hesitate to contact us today.